"If you want to divert the attention of people as you carry out an assault against them, frighten them." 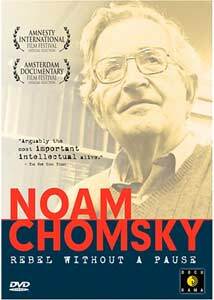 You've got to be pretty seriously committed (to say nothing of having basically no interest in music) to think of Noam Chomsky as a rock star, but that's sort of the premise of this documentary, a worshipful portrait of the influential linguist and professor in the months before the Iraq war. The documenting of Chomsky minutiae and comings and goings has apparently become something of a cottage industry—a sticker on the cover of the case of this DVD, for instance, crows that this is the most important Chomsky documentary since Manufacturing Consent, which may make you wonder just how many horses are in that race. Still, along with all the noise about Chomsky's celebrity is a good amount of Chomsky himself, articulating a point of view that gets abysmally short shrift in the mainstream media; even if you disagree with him vehemently, you'd have to admit that he's well read, well informed and hugely influential. The bulk of the documentary comes from Chomsky public appearances on a couple of college campuses in 2003; sometimes he's addressing packed lecture halls, other times he's in smaller, seminar-like settings with worshipful students, and the topic is almost always the Bush Administration and its plans for war in Iraq. One of Chomsky's overarching themes is about how the government fosters fear, to achieve its own ends; that's what's going on in the buildup to war, and also, he says, in the notion of Social Security privatization, getting working people to agree and thereby undermining their own economic interests. Chomsky has a lot to say, but he's not interested in being disagreed with; he shares that unfortunate tendency with people like Oliver Stone—that is, if you disagree about the conspiracy he's alleging, it proves only that you're part of the conspiracy. Chomsky goes over a couple of old chestnuts—the Cuban missile crisis, for instance; I also think that he's certainly overstating the case about McCarthyism, for his conclusion is: "Nothing happened." Ask the Hollywood 10 about that. But 9/11 in many respects made Chomsky's work newly relevant; not that he excuses the attacks, but he discusses them as the logical consequence of what he sees as the terror, invasion and imperialism of Europe. (He's happy in fact to include the U.S. as part of Europe for the purposes of this discussion.) He's also winning discussing the political constraints of the media, especially when it comes to NPR, from which he says a review of one of his books was suppressed by the higher-ups. Intercut with the Chomsky footage are interviews with Chomsky acolytes, and discussions with Chomsky's wife, Carol; they help to humanize him and make him more than just a collection of clips and op-ed pieces. She's especially charming when she discusses reluctantly taking on the role of her husband's tour manager, the Colonel Parker to his Elvis. Noam has left the building—thank you. Thank you very much. Image Transfer Review: Shot on video, the footage looks fair enough here, though it's very high on contrast, as you might expect. Audio Transfer Review: There's a little bit of Chomsky as diva at work here; he's always miked, but his questioners usually are not, so we miss out on most of what he's being asked. A little frustrating; perhaps subtitles might have helped? Extras Review: The principal extra is footage (37m:49s) from a Chomsky press conference, in which he discusses in more detail many of the same topics in the feature—these include the perils of the Bush Doctrine, the U.N.'s role in the run-up to the Iraq war, and the inclusion of North Korea in the axis of evil, to mask what Chomsky sees as an anti-Muslim, petroleum-centric agenda. You'll also find a two-paragraph statement from director Will Pascoe, and biographical notes on him and producer Jennifer Maclennan. A worshipful look at the major themes of Chomsky's work in the months leading up to the U.S. war in Iraq. A lot of this is probably preaching to the choir, but it's vintage, high-level stuff from one of our most important public intellectuals.